Point of Success Inventory is your best tool for tracking and controlling food cost. Think about this: Every dollar you save on food cost goes straight to profit! Your reward for using an inventory system is a more consistent guest experience, a smoother operation and more money in the bank. Set up all the ingredients you buy as inventory items. Use ingredients to create recipes for the items on your menu. Calculate the cost of your menu items then set the retail price to meet your profit goals. Use sub-recipes and production recipes to eliminate recipe steps and support the unique needs of your kitchen. 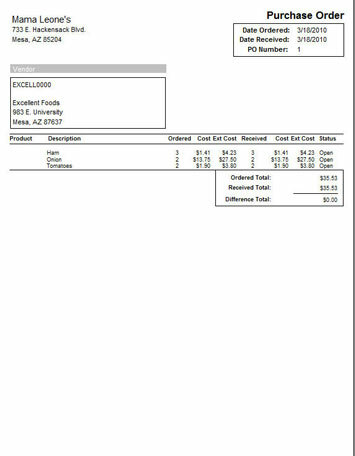 Every time you sell a menu item through your Point of Success point of sale system your ingredient inventory is automatically reduced. Your stock levels are managed, automatically suggesting inventory items and quantities to order. Order from a shopping list to see at a glance everything you need from all your vendors. Create purchase orders for your vendors. Print purchase orders for vendor sales reps or for call-in or fax orders. Receive vendor orders into inventory using the purchase order you’ve already created. Get alerts on critically low stock. Enter inventory counts and automatically adjust for discrepancies. Review reports that help identify your most critical inventory differences. Follow-up on your highest value items to make an immediate difference in food cost. Print recipe cards for use in food preparation. One screen gives you a ton of information! Point of Success Inventory helps you create purchase orders for each vendor. 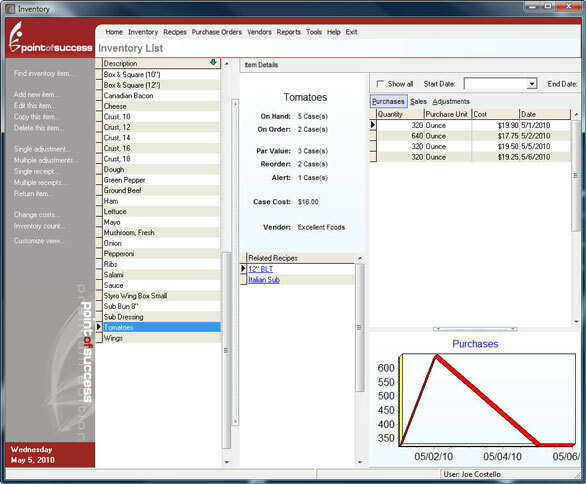 The shopping list suggests which items and quantities to order based on your current inventory, target stock level (par value) and vendor order minimums. Confirm quantities of each item and the shopping list creates a purchase order for each vendor. Receive vendor orders, update prices and replenish inventory through your purchase order. 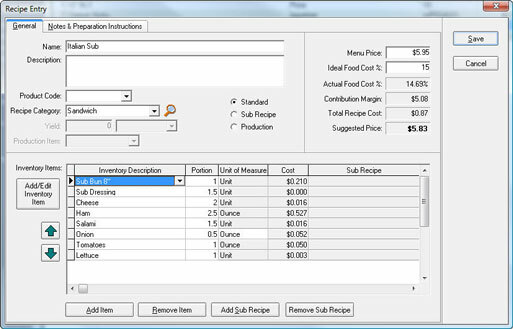 Recipes are used by Inventory to translate your sales into the ingredients to remove from inventory. Recipe cards can be printed for your kitchen staff, providing a reference that ensures uniform guest experiences. Select each ingredient used in the recipe and its quantity and unit of measure. Inventory converts between volume and weight measurements so your recipe makes sense in the kitchen. Sub-recipes can be used to include standard prep items in a recipe like a dinner salad or sandwich vegetables. Use production recipes for the ingredients you make yourself. Prepare a batch of pasta sauce, bread or similar items and Inventory removes the ingredients from your inventory and adds the finished ingredient. Your basic ingredients are converted to the prepared sub-ingredient for use in other recipes. Recipes store notes and preparation instructions for your staff. Low stock alerts show you which inventory items have critically low stock. Click an item in the list to go to the Inventory overview. the open purchase order list shows you each order you are expecting. Click an order to go directly to the Purchase Order center to receive the order. Top Sales menu items for the current month, prior month and year-to-date are displayed for your reference.